2019 Acura TLX Base 2.4 - Lease - Is this a Deal? Nope. 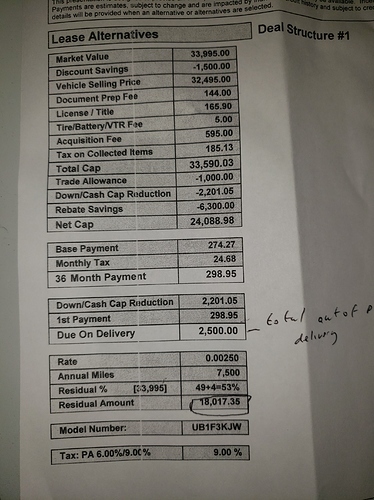 I’d want 2x the discount savings (2nd line) from the dealer before the $6300 lease cash show further down, and no cash down as a matter of smart business. The cash down is just masking the true cost of the lease so they could magically show you a number under $300/mo. So ask for an additional $1500 discount savings? When asking, what do you explain as rationale? Tell them that outside of the lease cash directly from Acura, they’re not really discounting the car that much. It’s an aging platform, an outgoing model (2020’s arriving just about any day now), and quite frankly if you search through these forums and/or the Edmunds forums you’ll see plenty of people getting better deals than what you’re showing. You’re not looking at the SH-AWD variety, so many on this forum will also be of the opinion that within the Honda/Acura family the new Accord will offer a better value for the same or less money than this base TLX. Thanks! I was going to just use the calculator and switch 10K => 12K but I didn’t know if the dealer was going to abide by that calculator! =) Again, thanks for the prompt response. And assuming your credit is fine, they’ve marked up the money factor. Thanks JRod - So the linked structure is a good deal? 305 with tax with 1800 DAS? Also want to add this is only 7,500 miles and PA, so the tax is levied on the payment. I think what he is showing you in the link is a deal where they’re getting roughly the same payment you’re shown on paper, without putting $2201 down out of pocket to make it that way. Even when accounting for the difference in taxes (which can be changed on the linked calculator) and changing the residual for the 7,500 miles as you noted, you’re paying too much. Thank you md1801. Should I aim for the 12,181? Would this be viewed as a good deal? Or is it more specific to certain variables? I just want to construct a counter offer that positions me to be offered a good deal. Thinking you should be around this with 7500 mile plus your 1k trade in. Acura of Aardmore were good to deal with I was working with them on a tech model but decided to go with a nj dealer instead. This link uses 12k as the mileage. The calculator does not allow for 7,500 as an input, but would this lower the payment by a certain percentage? 10k miles reduces the payment by $10, so I would assume another 10$ to bring the payment around $265 with tax? Good news… After some back and forth through text, they are wiling to match the deal. Should I ask for it in writing before I visit the dealer on Monday? Yes ask for the deal sheet to confirm. Yes, get the deal sheet. Glad it worked out. No idea, contact your insurance company. If you’re with a company like esurance it literally takes 2 mins to figure that out.